I love Eurostar. I love being able to just hop on a train in town at St. Pancras and then, a couple of hours later, hop off the train somewhere with different currency. No boring schleps to and from airports, just a quick train ride. It’s so civilized. I love the fact that if there’s something interesting happening in, say, Brussels, actually going over there is no more of a kerfuffle than going to Leeds or Bristol. So what interesting things are happening at the moment? 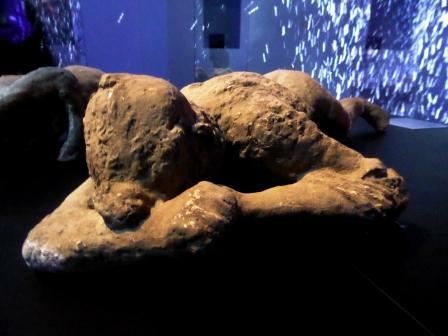 Well, in Brussels, at the Brussels Stock Exchange, is the exhibition Pompeii, the immortal city. Any exhibition about Pompeii comes with the possibility of a certain amount of baggage. It’s a big blockbuster story of a city frozen in time by a natural disaster, and just invites cliches. This exhibition walked what could be a fine line, as it utilized quite a lot of blockbuster effects but, overall, I think that it told a good story and it certainly had a lot of interesting things to have a look at. The exhibition starts with a story. The story of an ordinary Pompeian family. Of Caius, the only one of that family who survived. Once we’d met the characters, we went into a rotunda for our ‘immersive experience’. Signs made it clear that this was an artistic reimagining and not a scientifically correct rendition of events in AD 79. There’s a lot of lava. I can’t always be bothered with these sorts of ‘experiences’, especially if they’re used a a cover for ‘not much actual material’ but this was good and I stayed to watch it a couple of times. I needn’t have worried that there wouldn’t be anything substantial to back up the pyrotechnics, as there was plenty. I’m just adding a couple of favourites here. One feature of Pompeian archaeology that is always impressive is the range and quality of painted wall plaster that has survived. The images produced are often mythological or idealised but there are also realistic depictions of scenes of daily life and the ordinary objects that Pompeians had and used on a daily basis. At Pompeii, because there is so much well-preserved material, we have the opportunity to compare the pictures with the real things. 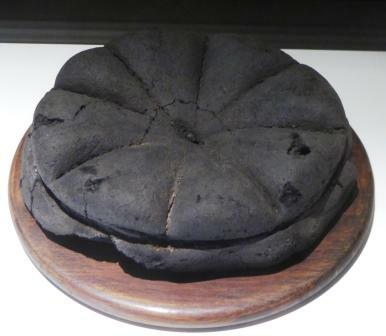 A favourite is the loaf of bread, carbonized by the heat from the eruption. The bread was formed into circular loaves and pre-scored into portions before baking. Often, the loaves were stamped with the name of the producer. Pompeian advertising. 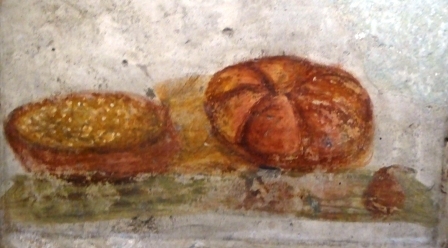 Images of this kind of bread can been seen in frescos depicting feasts and sumptuous table settings, and showing shops with the bakers doling out loaves from tall stacks. 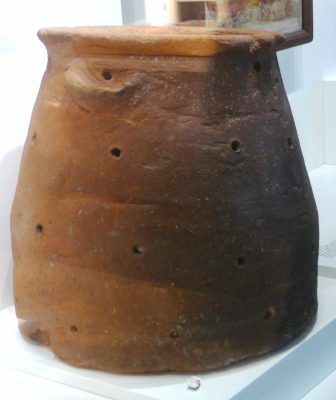 Another, rather unusual object on display was this large, squat pot, found at Herculaneum. It has holes in it, so isn’t made to contain a liquid. Inside there are ledges running all around the pot at different heights. This is a glirarium. When I work at outreach events, I sometimes ask visitors “what did Romans eat?” If there are children around, they will inevitably answer “dormice”. During the Roman period, edible dormice (Glis glis) were a delicacy, but only for the well off. The wild dormice were caught in the autumn and kept in these pots to be fattened up on walnuts, chestnuts, and acorns, and then turned into a savoury treat for the well to do. Recipes by Apicius include dormouse stuffed with pork and seasoned with pepper, nuts and laser and then roasted in the oven or boiled in broth. For a savoury/sweet twist, the dormouse was dipped in honey and sprinkled with poppy seeds. 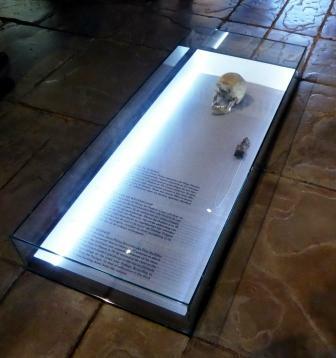 Alongside the artefacts from Pompeii, on loan from various Italian museums, there are reconstructions and working models, showing how things looked and how things worked. I actually quite liked these as they were firmly in the ‘How Stuff Works’ camp. Just as an example, here the ‘odometer’, used for measuring distances like the mileage clock on a car. 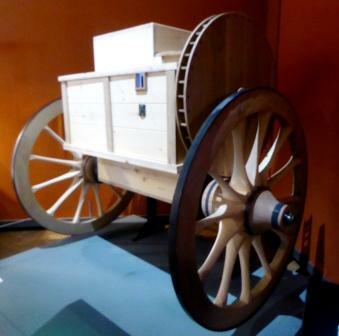 The ratchet is attached to the wheels of a cart and for every Roman mile travelled, a little stone drops into the box. In an expanding empire (in both the Republican and Imperial periods), being able to measure distances was really important for travel and trade, and for moving armies and their supplies. Milestones marked the distances between places. Odometers measured those distances. 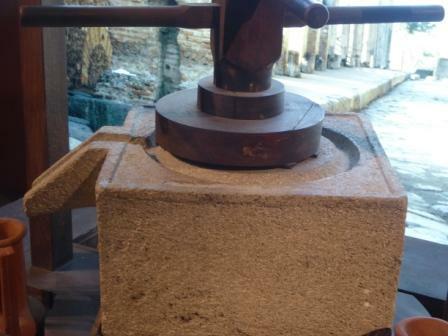 There was also this reconstruction of a screw-press for producing olive oil. I was slightly confused by this reconstruction. 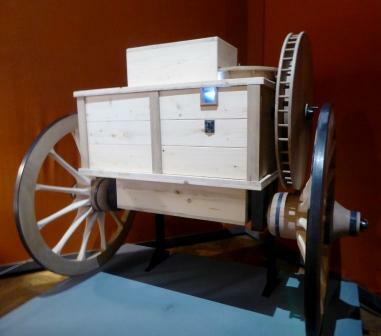 It didn’t seem to say that this was a scale model, but it looks extremely small for an olive oil press. The stone pressing bed is only about 50cm square. If it was this size, it’d only be able to manage relatively small quantities of olives for pressing at any one time. Maybe it’s for domestic use? 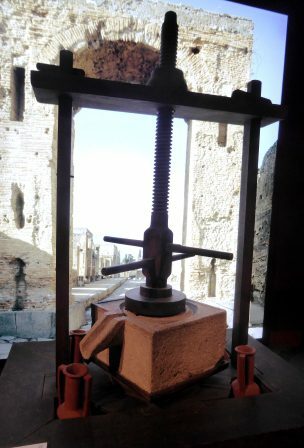 I’m not sure either, if a stone like the one here has been found at Pompeii or if this was just intended to be an illustration of a screw-press in a more general way, as there is olive oil production associated with the Pompeii hinterland. 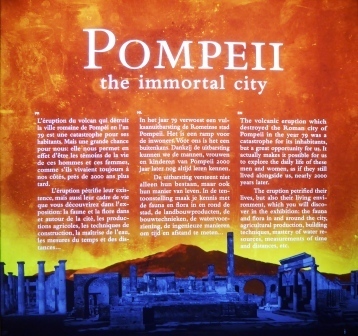 With Pompeii exhibitions, the people themselves are often the star attractions. 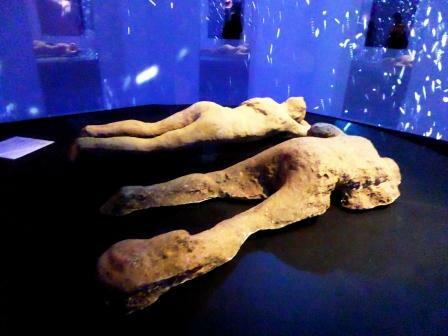 Casts of the imprints left by the people who died and were entombed in volcanic ash are a poignant reminder of the human cost of natural disasters. This exhibition has two of the casts. 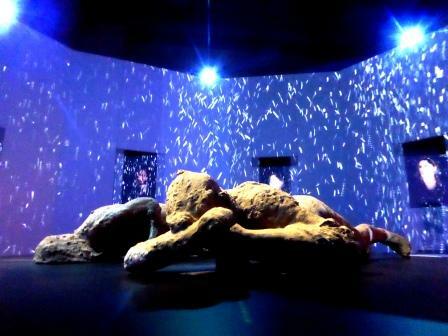 I liked the way that they were displayed, inside their own circular room with the the falling ash provided by av. It was quite atmospheric. It was possible to get quite close-up and see details of the casts; the lady’s ‘Livia’ hairstyle and the fact that she wore a shawl. One of the other famed, but less often seen victims of the Vesuvian eruption was Pliny the Elder. The eyewitness account written by his nephew Pliny the Younger in a letter to Tacitus, describes the lead-up to the eruption, the events on the day of the main onslaught, the desperate rescue efforts and the report of the death of his uncle. In the early 20th century, an engineer by the name of Gennaro Matrone began excavating in the area around Stabiae. 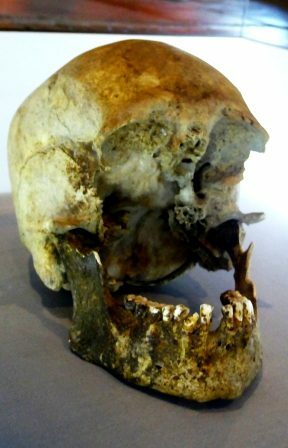 Among the ~70 skeletons that he excavated, was one which was found wearing a gold chain around the neck, bracelets and a short sword. Matrone’s interpretation of this find was that these must be the remains of Pliny the Elder. Archaeologists at the time rejected this identification on the grounds that a Roman commander would not be wearing such jewellery. More recently, researchers have agreed that the description of the jewellery found with the skeleton does seem to be compatible with decorations worn by military commanders of the 1st century. Further, the skull is that of a man in his mid-fifties, the age at which Pliny died. 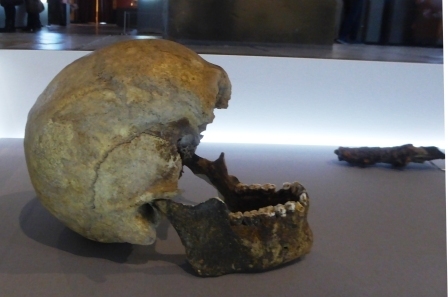 Sadly Matrone sold the jewellery and reburied the skeleton, keeping only the skull and the remains of the short sword, so the identification of these remains as Pliny the Elder is still uncertain. But tests have been ongoing, so it’s not impossible. I enjoyed this exhibition and thought that it was a good mix of crowd-pleasing special effects and satisfyingly interesting archaeological artefacts. 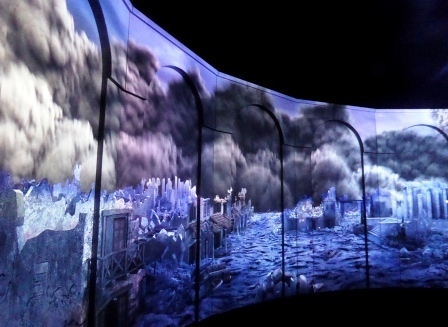 The exhibition makes extensive use of av devices. Visitors are issued with a headset on arrival and can follow the narrative of the Pompeian family, which links many of the objects. I had a bit of trouble with the headset, which kept cutting out, so I didn’t get to hear all the bits of linking storyline, but I’m not sure that I really needed it. I was happy to just have a look at the displays and there was some written information available too. The exhibition Pompeii, the Immortal City is on at the Brussels Stock Exchange until 15th April 2018. *I’ve never actually eaten a dormouse so I have no idea what one tastes like. Also, I’m vegetarian, so the chances of me ever finding out what a dormouse tastes like are slim to none. 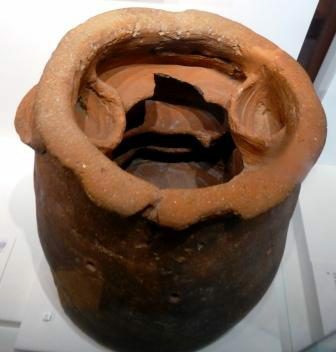 This entry was posted in Archaeology, Art and exhibitions, Belgium, Museums and Exhibitions, Romans, The Big Wide World and tagged Archaeology, Belgium, Brussels, Museum Blogger, Museum of Europe, Pompeii, Roman, Rome, volcano. Bookmark the permalink.